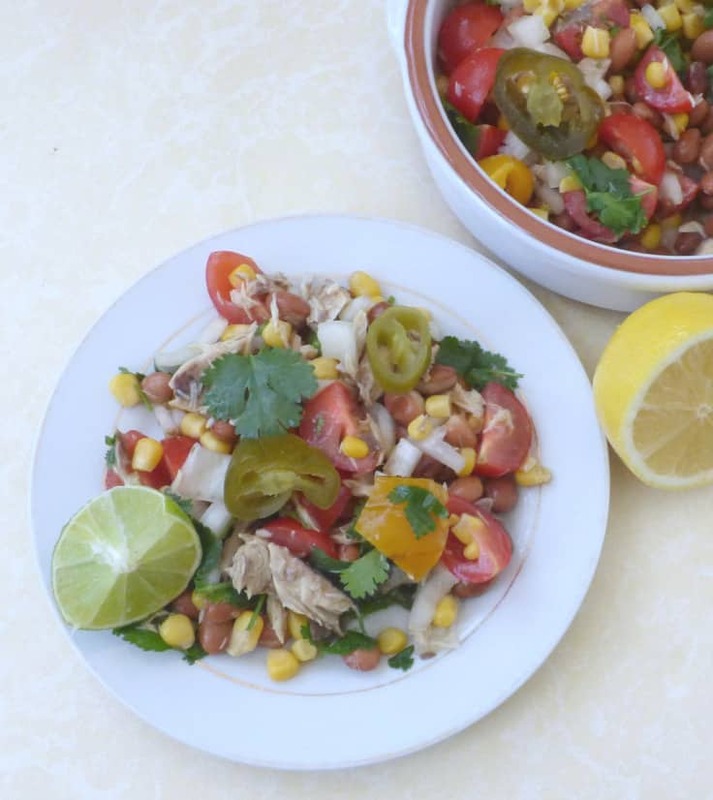 This tinned mackerel salad with coriander (cilantro) and lime is a hint of Mexican inspired freshness for the summer – and packed with nutrition. We sometimes eat tinned fish in sandwiches (check out my tinned mackerel sandwiches post). We often buy more than we need, however, and there’s usually a can or two lurking at the back of the cupboard. If you are the same – always aspiring to eat oily fish but never quite knowing what to do with it, this is the recipe for you. It’s really quick to make as it makes use of jarred antipasti and canned vegetables. Do you have a small child? They can be quite definite about what they like, can’t they? My son is highly suspicious of anything that looks like a leaf, but adores broccoli. This salad is entirely leaf free, and the jalapenos are optional. Instead, I’ve used citrus to provide the flavour boost. I should probably buy shares in sweetcorn and tinned tomatoes, as we get through so many. If you quarter cherry tomatoes so they’re not a choking risk, they’re a perfect size for small fingers. I can’t remember who taught me the trick of soaking onion in lemon juice or vinegar to take the bite out of it but it works well. The onion still has plenty of flavour but it becomes mild enough to eat raw. You can leave the janapenos out, stir them in, use them as garnish or chop them and mix them through – the choice is yours. Similarly, if you have a family member who doesn’t like cilantro/coriander, just serve it on the side or as a garnish so it’s easy to pick off. It’s such a versatile salad! If you’re feeling cheap you could roast a pepper yourself rather than buying a jar. Just chop it and pop it in the oven on gas mark 5 for an hour – it requires very little attention. This does add to the cooking time though, of course. Conversely, if you’re feeling flush, you can use hot smoked mackerel fillets in place of tinned mackerel. Dice the onion. Place it in a mug or small bowl with the juice of one lemon and one lime. Leave to soak. Rinse and quarter the cherry tomatoes. Place them in the salad bowl. 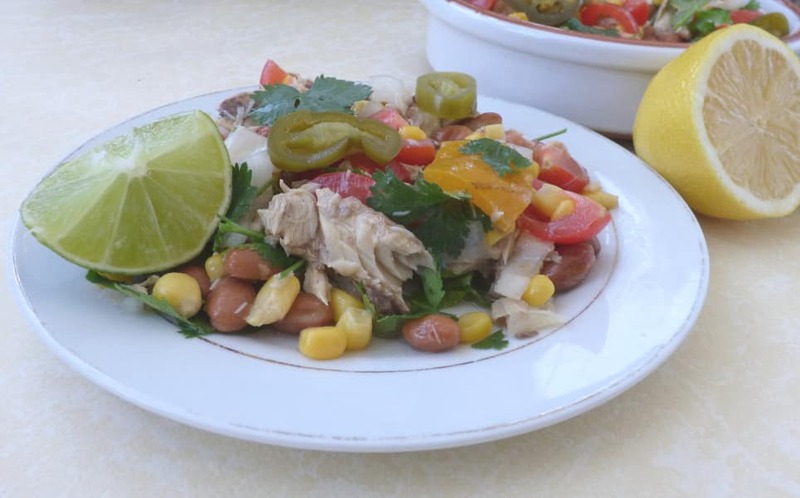 Open and drain the pinto beans and sweetcorn and mix them in. Rinse and roughly chop the coriander, and mix it in. Measure out the roast pepper and mix it in - if it comes in really big chunks you may want to chop it. Drain the mackerel and add it to the salad along with the onion and lemon/lime mixture. Add the jalapenos according to preference. Chop the remaining lime and serve on the side to squeeze over. 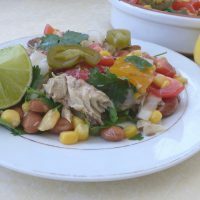 This looks like a yummy and easy recipe that is full of protein. WIll have to try it. Coriander & lime uplifts any dish when added!! A perfect summer salad...so quick and easy! I love mackerel!